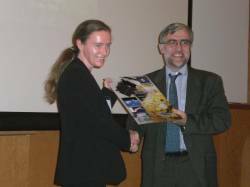 British small satellite manufacturer, Surrey Satellite Technology Ltd (SSTL), has received an award from the European Space Agency (ESA) acknowledging the successful GIOVE A mission and the company’s contribution to the success of the Galileo program. 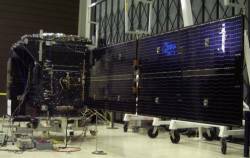 SSTL became involved in the Galileo program in 2003 with an ESA contract to build the first test bed satellite as part of the Galileo In Orbit Validation Element (GIOVE) of Galileo. SSTL designed, built, and tested GIOVE-A in a rapid 28 month schedule which allowed Europe to claim the ITU frequency filing. Since then the company has been actively involved with the in-orbit testing of GIOVE-A and, more recently, GIOVE-B, launched in April 2008. Results from several in-orbit test campaigns performed on the GIOVE-A navigation signals have confirmed that the payload performance has remained consistent during the life of the mission. As GIOVE-A continues to provide excellent performance and availability, the satellite’s mission has been extended a further year beyond its nominal lifetime of 27 months in order to maintain continuity of Galileo’s in-orbit validation prior to the launch of GIOVE-B and beyond. Last month, SSTL together with its German partner OHB-System was downselected by ESA and the European Commission (EC) as one of two potential suppliers of satellites to the Galileo operational system to be deployed by 2013.